Tired of hassling the complexities of the Modern Language Association’s Handbook? Tearing your hair out because your paper is due and you don’t know if the page layout or your citations and works cited are formatted correctly? Then save your sanity! 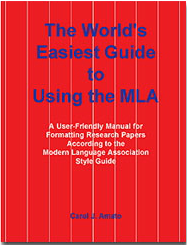 Take a look at our user-friendly tutorial, The World’s Easiest Guide to Using the MLA. Our easy-to-follow manual is packed with all the essential information you’ll need to format your paper quickly and easily according to the MLA's 5th edition style guide.